To: All Starfleet Commanders in vicinity of Typhon Sector. 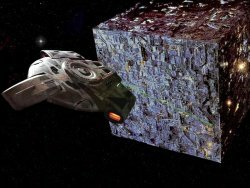 Reports from Deep Space Five have indicated a single Borg Cube en-route to Sector 001. All vessels capable of reaching the Typhon Sector are ordered to do so immediately, where we hope to eliminate this threat. Good Luck. Ramming is allowed. Boarding of Federation vessels by the Borg is allowed. Explosive warp core breach rules in effect. Borg: Eliminate all Federation vessels as a threat to the mission. I.e. minimum of disable their warp drives, and then warp out continuing to Earth. A Major Victory occurs if all Federation forces are captured or destroyed. Federation: Stop the Borg cube from completing its mission to assimilate Earth. Unfortunately, the only way to be assured of this outcome is its complete annihilation.